Exclusionology is the study of exclusions. Since 2014, the Exclusionology class has already brought training and challenging comparisons on the exclusion decision in latent print examination to hundreds of examiners. 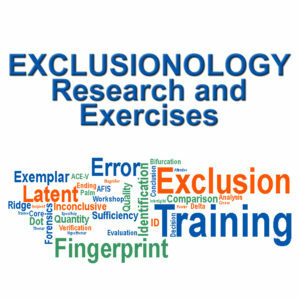 Exclusionology: Research and Exercises is updated for 2019 and discusses new research into the exclusion decision with new practical comparisons for attendees. This class reviews how to establish standards for exclusion and incorporate them into your agency’s protocols, how to use target groups when searching for similarities and differences, how to recognize sufficiency for the exclusion decision, and when the inconclusive decision is more appropriate. Upon completing the class, examiners will be able to employ techniques to reduce the risk of erroneous exclusion and gain confidence in their exclusion decisions.